For other uses, see Wild Honey (disambiguation). Wild Honey is the 13th studio album by American rock band the Beach Boys, released December 18, 1967 on Capitol Records. It was the group's first foray into soul music and was heavily influenced by the R&B of Motown and Stax Records (artists such as Stevie Wonder). Lead single and opening track, "Wild Honey", became a minor hit with only a short chart stay. Its follow-up "Darlin'" reached the US Top 20. The album itself reached number 24 in the US and number seven in the UK. The album's sessions began immediately after the abandonment of Lei'd in Hawaii, a failed live album, and the release of Smiley Smile, their previous studio album. Like Smiley Smile, Wild Honey's core instrumental combo consists of organ, honky-tonk piano, and electric bass. The Beach Boys were inspired to regroup as a self-contained rock band, partly in response to critical assertions that they were "ball-less choir boys". They also purposely distanced themselves from the prevailing rock trends of the time (psychedelia and high-scale recording or thematic conceits). The production was once again credited to the group rather than Brian Wilson alone, who gradually abdicated the band's musical leadership following the difficult sessions for the aborted Smile LP. At Brian's request, his younger brother Carl began contributing more to the recording process, a trend that continued on subsequent albums. Wild Honey became the Beach Boys' lowest-selling album at that point and remained on the US charts for only 15 weeks. Critics initially viewed it as another inconsequential record from the band. The album also alienated others whose expectations had been raised by Smile. After a 1974 reissue, Wild Honey was reevaluated by fans and critics who highlighted the record for its simplicity and charm. It would be the last Beach Boys album to feature Brian as a primary composer until The Beach Boys Love You (1977). The track "Here Comes the Night" was later redone by the group as a disco single in the late 1970s. In 2017, a complete stereo mix of Wild Honey was released for the first time on the rarities compilation 1967 – Sunshine Tomorrow. The Beach Boys in July 1967. 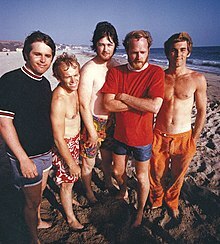 From left: Carl Wilson, Al Jardine, Brian Wilson, Mike Love, and Dennis Wilson. The Beach Boys' previous LP Smiley Smile, released in September 1967, peaked at number 41 on US Billboard charts for what was their worst performing album to date. A controversy involving whether the band was to be taken as a serious rock group had critics and fans divided, as journalist Gene Sculatti wrote at the time, "the California sextet is simultaneously hailed as genius incarnate and derided as the archetypical pop music copouts." The unfinished album that Smiley Smile came to replace, Smile, had acquired considerable press, and Capitol Records was still interested in putting the album out. In July 1967, an internal memo circulated around Capitol Records that discussed imminent plans to follow up Smiley Smile with a 10-track version of the original Smile, but this never came to fruition. Instead, the group attempted to record a live-in-the-studio album, Lei'd in Hawaii. When conflicts arose, the idea was dropped in favor of a new studio album. The image on the front of the Wild Honey sleeve is a small section of an elaborate stained-glass window that adorned Brian's home in Bel Air. For the liner notes, friend Arnie Geller and the Wilsons' cousin Steve Korthoff wrote: "Honey, of the wild variety, on a shelf in Brian's kitchen, was not only an aide to all of the Beach Boys' health but the source of inspiration for the record, Wild Honey ... We think this is a great album. We love to listen to it. We might just be biased because we work for the Beach Boys. Please see what you think." Singer Danny Hutton remembered: "The vibe was still great. He'd [Brian] have me over and he'd suddenly say: 'I've got this idea, man!' Then he'd point to a jar of wild honey. 'That's it! That's what the album's gonna be called!' And the other guys were thrilled." On Wild Honey, Carl Wilson's production work and lead vocals came into prominence as the Beach Boys moved closer to their R&B roots. For "Darlin'", he is accompanied by piano, bass, tambourine, strings, and horns. Wild Honey is a soul album that mixes pop and R&B styles. Unlike the band's previous R&B outings — which typically consisted of Chuck Berry-derived riffs — most of Wild Honey drew on the more emotive soul music associated with the Motown and Stax Records labels. Edwin Faust from Stylus Magazine wrote that its music focuses "simply on catchy hooks, snappy melodies and a straight-up boogie-woogie feel". Lenny Kaye, writing for Wondering Sound, felt that its "R&B leanings" may be attributed to Mike Love and Carl Wilson's vocal roles on the album. Carl said that his R&B side had "always wanted to come out. I have this massive collection of R&B records. When we were doing Pet Sounds, I'd go home and put on my Stax and Aretha stuff. It's always been a big part of my life." According to Love, the band made a conscious decision to be "completely out of the mainstream for what was going on at that time, which was all hard rock/psychedelic music. [The album] just didn’t have anything to do with what was going on." Billboard has also referred to it as a pop rock record. Wild Honey was music for Brian to cool out by. He was still very spaced. Recorded mostly at their private studio – located in Brian's home – the album may be retrospectively viewed as the second installment in a consecutive series of lo-fi Beach Boys albums. By the time of the album's recording, Brian was tired of producing the Beach Boys after having done it for several years, and so he requested that brother Carl contribute more to the process. The resulting album was partly a response to critical assertions that the group were "ball-less choir boys". Music theorist Daniel Harrison described Wild Honey as a self-conscious attempt by the Beach Boys to "regroup" themselves as a rock band in opposition to their more orchestral affairs of the past. Bruce Johnston recalled: "we wanted to be a band again. The whole [Smile] thing had wiped everyone out, and we wanted to play together again." The last time the Beach Boys had an album where they essentially played as a self-contained band was 1964's Shut Down Volume 2. The album differs in many ways from previous Beach Boys records: it contains very little group singing compared to previous albums, and mainly features Brian singing at his piano. The recording sessions lasted only several weeks, compared to the several months required for "Good Vibrations" (1966). Harrison say that its "simple songs" lacked the "enigmatic weirdness" and "virtuosic mesmerizers" present in Smiley Smile, but featured the same production approach and similar core instrumental combo of organ, honky-tonk piano, and electronic bass. The piano was slightly detuned, which Brian said made it "more like a twelve-string guitar, to get a more mellow sound. ... I loved what it did to the sound of the record." Musicologist Christian Matijas-Mecca noted that the "while the album's sparse production aesthetics and stripped-down sonic palette are deceiving, the album is arranged with an attention to detail and tonal clarity." Wild Honey was the last Beach Boys album to be mixed in mono. "Wild Honey" was co-written by Mike Love from the perspective of Stevie Wonder singing it. He felt that the album title was suggestive of both edible honey and "honey" as a term of endearment, "Aren't You Glad" is described by Rolling Stone magazine as a "Lovin' Spoonful type song with the Beach Boys touch", while magazine editor Gene Sculatti said it "achieves a Miracles style smoothness via a Bobby Goldsboro-type song". "I Was Made to Love Her" was originally recorded by Wonder, who had a number 2 hit with the song in July 1967. "A Thing or Two" is identified by Christian Matijas-Mecca as a "sibling" to Smiley Smile's "Gettin' Hungry", and that the vocal riff would be reprised in the group's 1968 single "Do It Again". "Darlin'" was one of the album's more developed productions, and was reworked from the earlier Brian Wilson/Mike Love composition "Thinkin' 'Bout You Baby". Initially, Brian had planned to give this song (along with "Time to Get Alone") to Three Dog Night, then called "Redwood", before Carl and Love insisted that Brian focus his attention on producing work for the Beach Boys. "I'd Love Just Once to See You" prefigured the writing style that Brian would later explore in the next studio album Friends. Brian would write several more "slice-of-life" style songs over the next few years. Daniel Harrison called "Let the Wind Blow" "the most arresting and compositionally assured song on the album, and it echoes the formal and harmonic technique of 'God Only Knows'." 4 time from beginning to end. "How She Boogaloed It" was the first original Beach Boys song (excluding instrumentals and cover versions) not to feature contributions from Brian. "Mama Says" is a chant that originated from an unreleased incarnation of the composition "Vegetables". It was the first time a track with thematic links to Smile was used to close a later Beach Boys album, the others being 20/20 (1969) and Surf's Up (1971). Inexplicably, when the alternate "Mama Says" version of "Vegetables" was released, Love's songwriting credit was not honored, and instead Van Dyke Parks' was listed as the song's only co-writer. In total, Brian is credited as composer or co-composer for only 9 of 11 tracks, compared to Smiley Smile in which he held a songwriting credit for every track. This would be the last Beach Boys album to feature Brian as a primary composer until The Beach Boys Love You (1977). Outtakes from the Wild Honey sessions include the originals "Can't Wait Too Long", "Time to Get Alone", "Cool, Cool Water", "Honey Get Home", and "Lonely Days". A solo recording of Brian performing the Smile song "Surf's Up" was lost and rediscovered several decades later at the end of the multi-track reel for "Country Air". Archivist Mark Linett stated: "No explanation for why he did that and it was never taken any farther. Although I don’t think the intention was to take it any farther because it's just him singing live and playing piano." The band also recorded cover versions of the Box Tops hit "The Letter" (1967) and Clint Ballard Jr.'s "The Game of Love" (1965). The New York Observer's Ron Hart said that the significance of the Beach Boys covering "The Letter" as sung by Alex Chilton is "simply beyond comprehension ... for that special kind of music nerd." Wild Honey was released on December 18, 1967 in competition with the Beatles' Magical Mystery Tour and the Rolling Stones' Their Satanic Majesties Request. It became the Beach Boys' lowest-selling album at that point and remained on the charts for only 15 weeks. As with Smiley Smile, contemporary critics viewed it as inconsequential. The album also alienated others whose expectations had been raised by Smile. Music journalist Paul Williams later wrote that Wild Honey was "a work of joy ... new and fresh and raw and beautiful", and that while the album's boogie woogie piano riffs "are, in their own way, as inventive as Brian’s more textured records ... we expected more (from Brian) than we would expect from any other composer alive, because the tracks we'd heard from Smile were just that good. Smiley Smile was ... a confusion ... and Wild Honey is just another Beach Boys record." Rolling Stone wrote at the time that the Beach Boys have regained their better judgement after the "disaster" of Smiley Smile, although their use of "pre-existing ideas and idioms" on Wild Honey is less satisfactory and original than their earlier work: "It's kind of amusing that the Beach Boys are suddenly re-discovering rhythm and blues five years after the Beatles and Stones had brought it all back home". Jazz & Pop's Gene Sculatti wrote: "[the Beach Boys] have the audacity to fool around with r&b, a territory indeed alien to them. Surprisingly, Wild Honey works well. It isn't the least bit pretentious, it's honest, and convincing." In a column for Esquire, Robert Christgau wrote that the album "epitomizes Brian Wilson", including the song "I'd Love Just Once to See You", which "expresses perfectly his quiet, thoughtful, sentimental artistic personality." In a 1968 Crawdaddy! article, David Anderle reported that the Doors' Jim Morrison considered Brian Wilson "his favorite musician" and Wild Honey "one of his favorite albums. ... he really got into it." Like Smiley Smile, Wild Honey was reevaluated by fans and critics who highlighted the record for its simplicity and charm after it was reissued by Warner Bros. in 1974. In a 1976 retrospective guide to 1967 for The Village Voice, Christgau felt Wild Honey is "so slight" but "perfect and full of pleasure". He argued that, "almost without a bad second", the album conveys "the troubled innocence of the Beach Boys through a time of attractive but perilous psychedelic sturm und drang. Its method is whimsy, candor, and carefully modulated amateurishness, all of which comes through as humor." In 1978, he ranked Wild Honey number 10 on his list of the best rock albums and later included in it in his "Basic Record Library" of 1950s and 1960s recordings, published in Christgau's Record Guide: Rock Albums of the Seventies (1981). Music journalist Tim Sommer called the original mono mix of Wild Honey "flat and peculiar", but noted the album's significance as a "[courageous contradiction of] rock's expansion into pompous avenues of volume, psychedelia and lyrical pretension". He called it a precursor to albums such as the Kinks' Village Green Preservation Society and the Byrds' The Notorious Byrd Brothers (both 1968). Record producer Tony Visconti listed Wild Honey as one of his 13 favorite albums and said that "I still refer to this record as a benchmark in the same way that I do Revolver." In 2012, Rolling Stone ranked Wild Honey at number two on its "Coolest Summer Albums of All Time" list, praising its "hedonistic rock & roll spirit", "humor" and "pensive depth". In a negative review, Pitchfork critic Spencer Owen said only "one or two" songs succeed and the majority of Wild Honey is "not pretty" because of its R&B vein as "interpreted by white surfer boys", including "a Stevie Wonder cover sung with as much faux-soul as Carl Wilson could have possibly mustered". Writing in his Encyclopedia of Popular Music, Colin Larkin pairs the album with the "scrappy" Smiley Smile as two "hastily released" works that show how the Beach Boys' music had "lost its cohesiveness", with Brian Wilson's reduced involvement. In his review for AllMusic, Richie Unterberger wrote that, apart from "Darlin'", "Here Comes the Night" and the title track, most of Wild Honey was "inessential". He found the music "often quite pleasant, for the great harmonies if nothing else, but the material and arrangements were quite simply thinner than they had been for a long time." In 2017, a complete stereo mix of Wild Honey was released for the first time on the rarities compilation 1967 – Sunshine Tomorrow. The set also includes numerous session highlights, alternate takes, and live renditions of Wild Honey tracks in addition to other unreleased material recorded during the Smiley Smile and Lei'd in Hawaii era. Several months later, the compilation was followed with two more digital-exclusive releases: 1967 – Sunshine Tomorrow 2: The Studio Sessions and 1967 – Live Sunshine. They include more than 100 tracks that were left off the first compilation. Al Jardine – vocals, rhythm guitar on "I'd Love Just Once To See You"
Bruce Johnston – vocals, organ on "Wild Honey" and "How She Boogalooed It", bass on "Wild Honey"
Hal Blaine – drums on "Darlin'"
Ron Brown – bass on "Darlin'", "I Was Made to Love Her", and "Here Comes the Night"
Paul Tanner – Electro-Theremin on "Wild Honey"
It is unknown who played strings and horns on "Darlin'". ^ a b c d Leaf 1985, p. 125. ^ Schinder 2007, p. 119. ^ a b c Sculatti, Gene (September 1968). "Villains and Heroes: In Defense of the Beach Boys". Jazz & Pop. Archived from the original on July 14, 2014. ^ Matijas-Mecca 2017, pp. 82–83. ^ a b c Doe, Andrew G. "Unreleased Albums". Bellagio 10452. Endless Summer Quarterly. Retrieved July 13, 2014. ^ a b c d Badman 2004, p. 208. ^ a b c d e f g h i j Leaf, David (1990). Smiley Smile/Wild Honey (CD Liner). The Beach Boys. Capitol Records. ^ Carlin 2006, p. 129. ^ Preiss 1979, p. 87. ^ a b Badman 2004, p. 203. ^ Dillon 2012, pp. 305–306. ^ Faust, Edwin (September 1, 2003). "The Beach Boys – Smiley Smile/Wild Honey – On Second Thought". Stylus Magazine. Retrieved June 22, 2013. ^ Kaye, Lenny (September 18, 2012). "Beach Boys, Wild Honey (2001 – Remaster)". Wondering Sound. Archived from the original on August 20, 2016. Retrieved June 22, 2013. ^ Himes, Geoffrey (September 1983). "The Beach Boys High Times and Ebb Tides Carl Wilson Recalls 20 Years With and Without Brian". Musician (59). ^ a b Hart, Ron (July 20, 2017). "5 Treasures on the Beach Boys' New '1967—Sunshine Tomorrow'". New York Observer. ^ "Campus Briefs". Billboard (November 9): 3. 1974. Retrieved July 5, 2016. ^ Chidester, Brian (March 7, 2014). "Busy Doin' Somethin': Uncovering Brian Wilson's Lost Bedroom Tapes". Paste. Retrieved December 11, 2014. ^ "The Beach Boys". Music Favorites. Vol. 1 no. 2. 1976. ^ a b Sommer, Tim (July 7, 2017). "A Brilliant New Compilation Captures The Beach Boys' Most Pivotal Year". LA Weekly. ^ a b Harrison 1997, p. 51. ^ Wilson & Greenman 2016, p. 151. ^ Matijas-Mecca 2017, p. 83. ^ Sharp, Ken (September 18, 1992). "Love Among The Ruins". Goldmine. p. 19. ^ a b "Wild Honey". Rolling Stone. New York. February 24, 1968. Retrieved June 22, 2013. ^ Corpuz, Kristin (May 13, 2017). "Stevie Wonder's Biggest Billboard Hot 100 Hits". Billboard. ^ a b Matijas-Mecca 2017, p. 84. ^ Hickey 2011, p. 142. ^ Harrison 1997, pp. 50–51. ^ Hickey 2011, p. 143. ^ Hickey 2011, p. 145. ^ Wilson & Greenman 2016, p. 262. ^ Badman 2004, pp. 203, 205, 208. ^ Christgau, Robert (June 1968). "Columns". Esquire. Retrieved June 22, 2013. ^ Anderle, David; Williams, Paul (1968). "Brian: Part Three". Crawdaddy!. ^ a b Unterberger, Richie. "Wild Honey". AllMusic. ^ Wolk, Douglas (October 2003). "Smiley Smile/Wild Honey". Blender. Archived from the original on June 30, 2006. Retrieved July 4, 2017. ^ Larkin 2006, p. 479. ^ a b Owen, Spencer (March 29, 2001). "The Beach Boys: Smiley Smile/Wild Honey". Pitchfork. Retrieved June 22, 2013. ^ Fine 2004, pp. 46, 48. ^ Iai (February 20, 2008). "The Beach Boys - Wild Honey". Sputnikmusic. Retrieved December 20, 2018. ^ a b Christgau, Robert (December 20, 1976). "Christgau's Consumer Guide to 1967". The Village Voice. New York. p. 69. Retrieved June 22, 2013. ^ Matijas-Mecca 2017, p. 85. ^ Gambaccini, Paul (1978). Rock Critic's Choice: The Top 200 Albums. United States: Omnibus. pp. 83–84. Retrieved October 30, 2012. ^ Marszalek, Julian (October 31, 2012). "Tony Visconti On Wild Honey". The Quietus. Retrieved November 1, 2012. ^ Sheffield, Rob (July 18, 2012). "The 10 Coolest Summer Albums of All Time". Rolling Stone. Retrieved January 5, 2015. ^ Larkin 2006, p. 477. ^ Jarnow, Jesse (July 1, 2017). "1967 - Sunshine Tomorrow". Pitchfork. ^ Reed, Ryan (December 8, 2017). "Beach Boys Unearth Rare Studio, Live Tracks for New 'Sunshine' Sets". Rolling Stone. ^ Stephenwdesper (March 17, 2002). "Dear Mr. Desper". surfermoon.com. Dillon, Mark (2012). Fifty Sides of the Beach Boys. Toronto, Ont. : ECW Press. ISBN 978-1-77090-198-8. Fine, Jason (2004). The New Rolling Stone Album Guide (4th ed.). London: Simon & Schuster. ISBN 0-7432-0169-8. Gaines, Steven (1986). Heroes and Villains: The True Story of The Beach Boys (1. Da Capo Press ed.). New York: Da Capo Press. ISBN 0-306-80647-9. Harrison, Daniel (1997). "After Sundown: The Beach Boys' Experimental Music" (PDF). In Covach, John; Boone, Graeme M. (eds.). Understanding Rock: Essays in Musical Analysis. Oxford University Press. pp. 33–57. ISBN 978-0-19-988012-6. Hickey, Andrew (2011). The Beach Boys On CD: Volume 1 1961–1969. lulu.com. ISBN 978-1-4475-4233-9. Hodgkins, Nig (1996). Buckley, Jonathan (ed.). Rock: The Rough Guide (1st ed.). London: Rough Guides. ISBN 1-85828-201-2. Larkin, Colin, ed. (2006). The Encyclopedia of Popular Music (4th ed.). London: Oxford University Press. ISBN 978-0-19-531373-4. Leaf, David (1985). The Beach Boys. Courage Books. ISBN 0-89471-412-0. Preiss, Byron (1979). The Beach Boys. New York: Ballantine Books. ISBN 978-0-345-27398-7. Schinder, Scott (2007). "The Beach Boys". In Schinder, Scott; Schwartz, Andy (eds.). Icons of Rock: An Encyclopedia of the Legends Who Changed Music Forever. Westport, Connecticut: Greenwood Press. ISBN 978-0-313-33845-8.